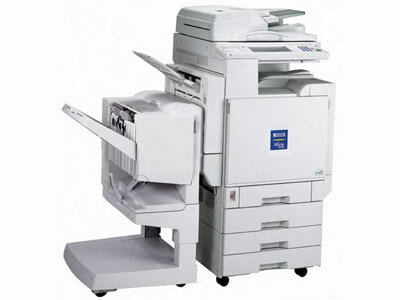 The Ricoh 2232C, introduced in February 2004, is a full-color multifunction unit designed for offices with high paper throughputs looking to produce documents at resolutions and sizes consistent with other models like it. Note that the 2232C and the 2238C are essentially the same printer, though the 2238C offers slightly faster print speeds. The 2232C measures 27.48" by 33.82" by 26.38" and weighs 264.55 lbs. At this size, it's too short to stand alone, requiring a table or a credenza on which the unit can rest comfortably. The Aficio 2232C can produce copies or prints at speeds of 32 copies per minute in black and 24 copies per minute in color, above the standard 20 pages per minute but considerably slower than newer models capable of delivering 40-60 pages per minute. It is also able to produce a maximum number of 999 copies simultaneously. Auto duplexing is also standard, saving time and the money that could go into a costly upgrade. The 2232C's zoom allows for documents to be sized between 25% and 400%, scaled in 1% increments. It produces copies at a maximum resolution of 600 dpi. The 2232C includes a standard paper capacity of 500 sheets with a 100 sheet bypass tray, expandable to a maximum of 3100 sheets, and can store up to 600 sheets in its output tray. It can also print to plain paper, transparencies, card stock, and labels between the sizes of 3.5" by 5.8" and 12" by 18". In its default configuration it should easily meet the needs of a small office with minimal downtime for paper replacement, and expanded should satisfy even environments that go through many 500-sheet reams of paper daily. 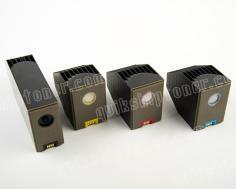 An automatic document feeder is also included standard to further increase efficiency. The 2232C produces prints at resolutions of either 600 dpi or 1200 dpi and scans betwen 100-600 dpi in color and 100-1200 dpi in black and white. The 2232C includes 768 MB of RAM and an 80 GB hard drive, likely more than enough for almost any industry application and significantly larger than the amount of either RAM or disk space offered by contemporary or even more current copiers like this one. The 2232C's scanner includes support for Scan to E-Mail and Scan to Folder standard, along with support for LDAP. It can process documents sent via PCL 5c emulation, or Adobe PostScript 3 via an optional add-on. 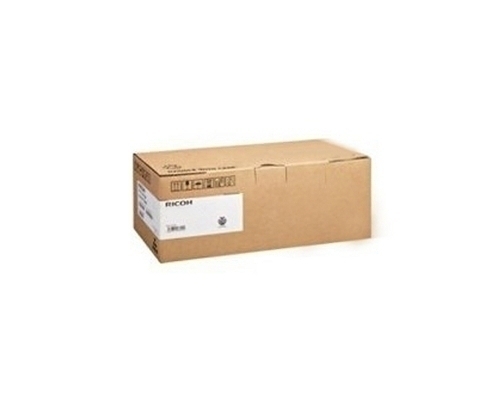 The 2232C includes a 10/100 BaseTX Ethernet port and a Parallel port, making it essentially compatible with either a networked environment or legacy PCs. If other connections are necessary, the 2232C includes expansion support for 802.11b, USB 2.0, IEEE 1394 Firewire, and Bluetooth. The copier cannot copy documents larger than 8.27" by 11.69" in full, though it can print to them, worth considering if intending to use the 2232C to produce large-scale documents. Furthermore, the lower resolution in producing and scanning color copies could easily disqualify this printer from seeing heavy use in environments not intending to purchase another printer for either large documents or graphics work. 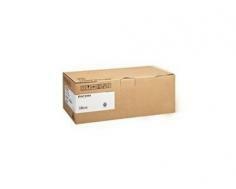 Review it: "Ricoh Aficio 2232c "
The 2232C requires four toner cartridges to produce black and color prints. It requires a black cartridge, rated at a yield of 18000 pages at 5% coverage, as well as color cartridges cyan, magenta, and yellow, rated at 10000 pages at approximately 5% coverage each. Furthermore, the copier will require that its drum unit be replaced at every 52000 pages, which may synchronize closely with either three black cartridge replacements or five sets of color replacements, depending on your toner usage and paper throughput. By separating these components, you bring down long-term maintenance costs but do increase the amount of maintenance necessary to ensure copier function, as a number of units offer higher-cost combination toner/drum units. Conveniently, while Ricoh used to sell separate color and black drum units, the functions are now combined into a single unit to ensure easy ordering and replacement.